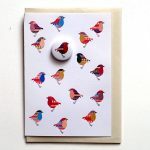 It’s ideal for pattern lovers and is blank inside for your own message. 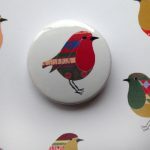 The lovely friendly robin badge will compliment a fairisle jumper (or any other lovely knitwear). Illustrated by Lindsay in our seaside studio near Margate. 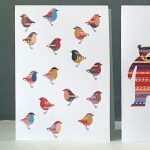 It has been printed on 330gsm FSC certified white card. It is supplied with a cream envelope as shown.